12.5 mm x 120 mm tongue and grooved V-board, the ledged and braced door is hung on three T-hinges, secured by a lock and key. The window section can be fitted on either side. 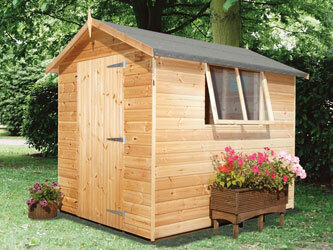 Although installation can be arranged, Premier's flat pack sheds are easy to assemble and supplied with fixtures, fittings & heavy-duty roofing felt. The Deluxe Apex is untreated, as standard, a variety of treatments being avaialble as an optional extra. Double Window Size 3' 4" x 2' 3"